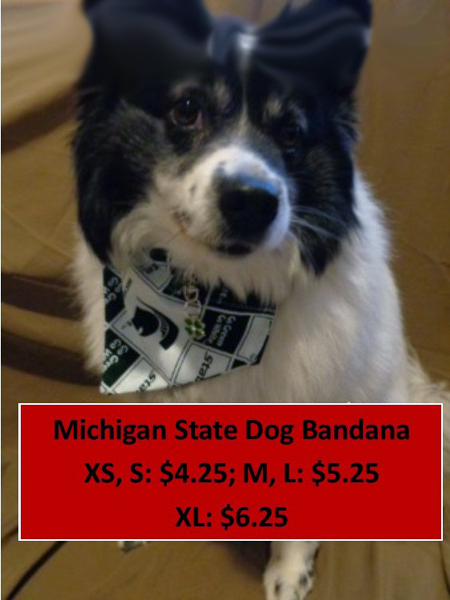 This Michigan State bandana is a classic accessory for the handsome and dashing dog. 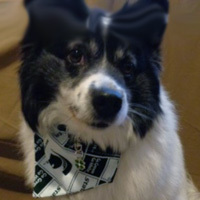 The Michigan State Dog Bandana is in green and white with Michigan State emblems. Simply slip the bandana over the collar and you and pooch are on your way – or slip the bandana onto the leash. Measure your pets neck to be sure what size is best suited for your pet. The bandana is NOT made to go completely around the dog’s neck. Take into consideration if your pet is furry around its neck, you may need a larger bandana to accommodate the fur. Or measure the width of the collar your pet wears to help determine the correct size bandana needed. Dog Bandana fits over and through the dog collar. Double sided of polyester/cotton blend. This bandana is handmade from officially licensed fabric. These bandanas are not endorsed or licensed by the team they represent nor are they being sold as official team merchandise. They are sold by rights granted by the US Supreme Court by the First Sale Doctrine.